 Uncertainties regarding the short-term economic outlook have risen dramatically in recent months. A number of events, notably related to the euro area debt crisis and fiscal policy in the United States, are likely to dominate economic developments in the coming two years. In an "events-free" scenario and in the absence of comprehensive policy action to resolve current problems, real GDP is projected to grow by about 3.9% this year, 3.8% in 2012 and 4.6% in 2013 on average in G20 countries.1 This average masks a wide divergence among country groupings, and emerging-market economies are much more buoyant, despite some softening. In the euro area, a marked slowdown with patches of mild negative growth is likely. Growth is also projected to remain weak in the United States, with a gradual pick-up from 2012 towards the end of the projection period. Unemployment is set to remain high in many advanced countries.  A better upside scenario can materialise if the policy measures that were announced at the Euro Summit of 26 October are implemented promptly and forcefully. These measures go in the right direction and could help restore confidence and create positive feed-back effects that could trigger a scenario of stronger growth.  In contrast, the outlook would be gloomier if the commitments made by EU Leaders fail to restore confidence and a disorderly sovereign debt situation were to occur in the euro area with contagion to other countries, and/or if fiscal policy turned out to be excessively tight in the United States. OECD analysis suggests that a deterioration of financial conditions of the magnitude observed during the global crisis (between the latter half of 2007 and the first quarter of 2009) could lead to a drop in the level of GDP in some of the major OECD economies of up to 5% by the first half of 2013.  To resolve the euro area crisis, it is important to clarify and implement fully and decisively the measures announced on 26 October to break the link between sovereign debt and banking distress, to deal with Greece, to ensure that the sovereign debt crisis does not spread to other European countries and to secure appropriate capitalisation and funding for banks. Detailed information is needed on how the package will be implemented.  In the advanced G20 economies, interest rates should remain on hold or, where possible, be reduced, notably in the euro area. Central banks should continue to provide ample liquidity to ease financial market tensions. Further monetary relaxation, including through unconventional measures, would be warranted if downside risks intensify. In the emerging-market economies, the stance of monetary policy should be guided by the outlook for growth and inflation, which remains comparatively high.  Strong, credible medium-term frameworks for fiscal consolidation and durable growth are needed to restore confidence in the longer-term sustainability of the public finances and to build budgetary space to deal with short-term economic weakness. Those advanced economies with sounder public finances can provide additional counter-cyclical support.  Structural reforms are essential to boost the growth potential of G20 countries, to tackle high unemployment and to rebalance global demand. In view of weak growth in the near term and impaired fiscal positions in most advanced economies, priority should be given to reforms that offer comparatively strong short-term activity gains and facilitate longer-term fiscal consolidation. Over the past two decades, bilateral trade between LAC and Korea has expanded rapidly, growing at an annual average rate of 16.1%. This is a faster rate of growth in trade than LAC experienced with East Asia (15.1%),1 the U.S. (9.8%), the European Union (E.U.) (7.4%) and Japan (7.7%). Only trade with China grew at a more rapid pace (27.5%). Despite this remarkable dynamism, Korea’s share of LAC’s trade is still fairly small. Since 1990, its share has risen from a little over 1% to 2.5%, whereas China’s share reached the 13% mark in the same period. LAC’s share of Korea’s trade, though, is higher (5.1% in 2010) and not very different from the region’s share of China’s trade. Mercer's latest What's Working™ survey, conducted among nearly 30,000 employees in 17 markets worldwide from Q4 2010 to Q2 2011, offers provocative new insights into the minds of the global workforce. Mercer's research found employees generally less engaged and less committed to their employers today. 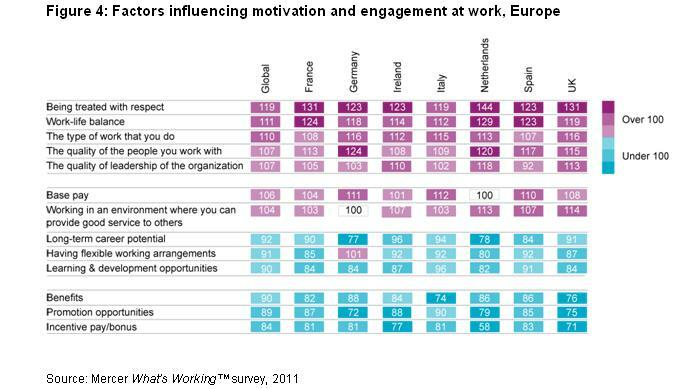 And while some common threads emerged – especially by age group – the research shows that views of work remain deeply ingrained not just by region, but by individual country. 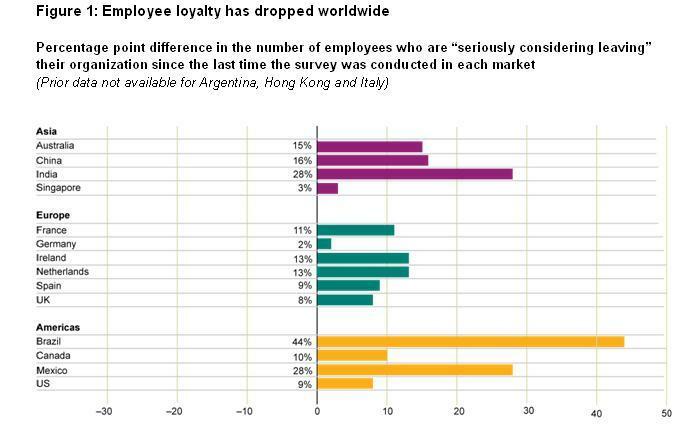 Employee loyalty is dropping around the world, according to new global analysis of Mercer’s What’s Working™ survey. 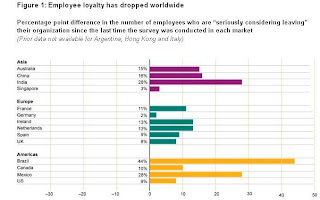 The research, conducted among nearly 30,000 employees in 17 geographic markets between the fourth quarter of 2010 and the second quarter of 2011, shows that the percentage of workers seriously considering leaving their organization has risen since the last time the survey was conducted in each market (between 2003 and 2006 prior to the economic downturn). 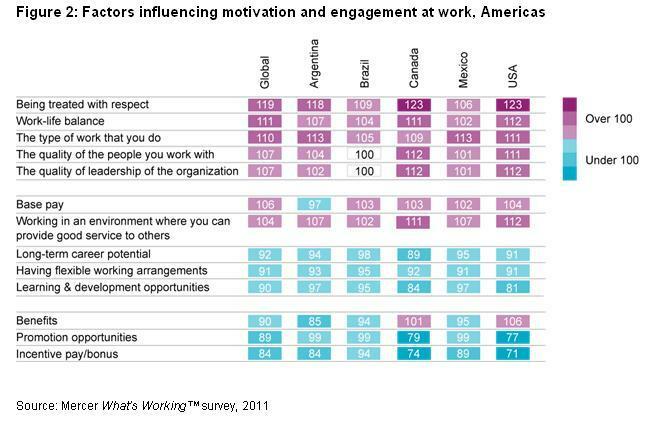 The survey analysis also shows shifting views on other workforce issues that affect engagement. Worldwide, views on pay and performance issues generally improved, while views on employee benefits generally declined. By market, views were mixed on subjects like career opportunity and leadership. 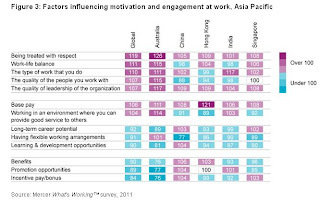 The global analysis also reveals that nonfinancial factors play a prominent role in influencing employee motivation and engagement – a finding that could prove useful to employers facing budget constraints. 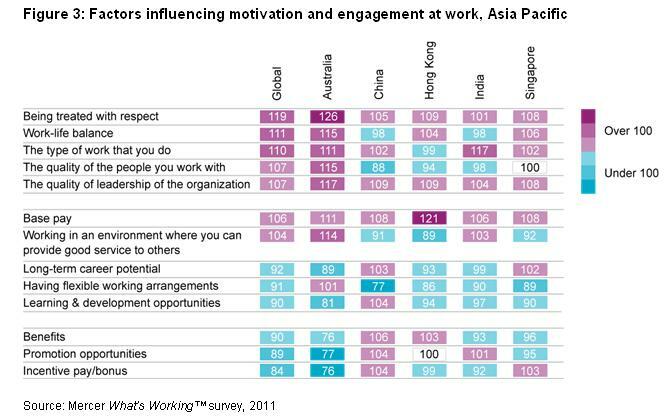 Workers worldwide say that being treated with respect is the most important factor, followed by work/life balance, type of work, quality of co-workers and quality of leadership. Among financial factors, base pay ranks highest globally, at sixth out of 13 factors. It ranks as the top factor in just one market (Hong Kong) and among the top three most influential factors in four other markets – China, India, Italy and Singapore. 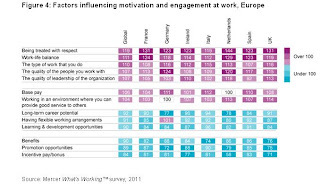 While other financial factors, such as benefits and incentive pay, can be important to other aspects of the employment deal – such as attracting, retaining and rewarding employees – Mercer’s research shows they are considered less important by employees when it comes to their day-to-day motivation and engagement at work. “Employee engagement reflects the total work experience, and a big part of it is how you are treated, what kind of work you do and how you feel about your co-workers, bosses and the general work environment,” said Colleen O’Neill, PhD, a Senior Partner at Mercer and the firm’s Talent Leader in the US and Canada. In the US, the importance of financial and nonfinancial factors closely mirrored the global findings. Two areas of note that scored higher than the global average were benefits and working in an environment where you can provide good service to others. Areas below the global average for US employees included learning and development opportunities, promotion opportunities and incentive pay/bonus. Visit http://inside-employees-mind.mercer.com/global for an interactive look at additional global findings from Mercer’s What’s Working survey. The interactive site provides a snapshot of the survey findings in all 17 markets, shows data views by region and allows visitors to create custom views of the data featuring their choice of up to six markets. Mercer’s proprietary What’s Working survey, which examines employee views on work, includes more than 100 questions on a range of work-related topics and reflects the overall workforce demographics of the 17 survey markets in terms of age, gender and job level. 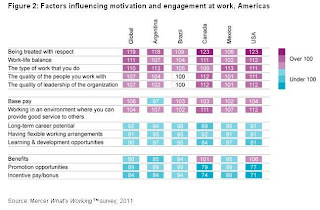 To arrive at the results regarding what motivates employees, Mercer asked survey respondents worldwide to consider both current and previous jobs and state how important 13 factors were in influencing their motivation and engagement at work. The top rating of “extremely important” could only be used for the one or two most important factors. Scores are assigned to an index of 100 to show relative importance by market and globally. Scores near 100 are of middle importance, scores above 100 are more important and scores below 100 are less important. Mercer is a global leader in human resource consulting, outsourcing and investment services. Mercer works with clients to solve their most complex benefit and human capital issues by designing, implementing and administering health, retirement and other benefit programs. Mercer’s investment services include investment consulting, implemented consulting and multi-manager investment management. Mercer’s 20,000 employees are based in more than 40 countries. The company is a wholly owned subsidiary of Marsh & McLennan Companies, Inc., which lists its stock (ticker symbol: MMC) on the New York and Chicago stock exchanges. For more information, visit www.mercer.com. This tool kit makes available to communities of practice, both Asian Development Bank (ADB)-hosted and external to it, a select set of resources in the areas of strategy development, management techniques, collaboration mechanisms, knowledge sharing and learning, and knowledge capture and storage. •What are Communities of Practice? In many ways the power of the social protection floor lies in its simplicity. The floor is based on the idea that everyone should enjoy at least basic income security sufficient to live, guaranteed through transfers in cash or in kind, such as pensions for the elderly and persons with disabilities, child benefits, income support benefits and/or employment guarantees and services for the unemployed and working poor. Together, in cash and in kind transfers should ensure that everyone has access to essential goods and services, including essential health services, primary education, housing, water and sanitation. This report, prepared under the guidance of Ms Michelle Bachelet and members of the Advisory Group, shows that the extension of social protection, drawing on social protection floors, can play a pivotal role in relieving people of poverty and deprivation. It can in addition help people adapt their skills to overcome the constraints that block their full participation in a changing economic and social environment, contributing to improved human capital development and stimulating greater productive activity. The report also shows how social protection has helped to stabilize aggregate demand in times of crisis and to increase resilience against economic shocks, contributing to accelerate recovery towards more inclusive and sustainable development paths. NEW YORK (ILO News) – A high-level panel headed by the former President of Chile, Michele Bachelet, today delivered a ground-breaking report to UN Secretary-General, Ban Ki-moon, arguing that a social protection floor could boost economic growth and enhance social cohesion. The report, “Social Protection Floor for a Fair and Inclusive Globalization”, was immediately welcomed by several world leaders including Brazilian President Dilma Rousseff and French President Nicolas Sarkozy, as well as other prominent leaders in the world of work. The new report says an estimated 5.1 billion people lack adequate social security or social protection worldwide, while just over 15 per cent of the world’s unemployed worldwide are receiving some form of unemployment benefits. Preliminary conclusions of the report were presented to the G20 labour ministerial meeting in Paris in September, and garnered an immediate pledge by the group to support new measures aimed at extending social protection worldwide as a means of reducing poverty, stimulating economies and hedging against the impacts of economic crises. “Extending social protection is a ’win-win’ investment that pays off both in the short term, given its effects as a macroeconomic stabilizer but also in the long term, due to the impacts on human development and productivity” Ms. Bachelet said. The ILO’s annual international labour conference in 2012 is to consider a new international labour standard on social protection floors. Social protection – and in particular the concept of a social protection floor – has been increasingly recognized as a key development instrument at different international fora, most recently at the UN Summit on the Millennium Development Goals in September 2010. Bureau of Economic Analysis. In the second quarter, real GDP increased 1.3 percent. partly offset by a larger decrease in private inventory investment. dollars. Price indexes are chain-type measures. Border-gate economic zones (BEZs) are symbols of the increased cross-border exchange and the development initiative of the border areas in the Greater Mekong Subregion (GMS). Over the past decade, BEZs have been able to attract a great number of women workers seeking for new job opportunities. Using survey data collected at the BEZs of Mong Cai, Cau Treo, and Moc Bai in Viet Nam and from the Viet Nam Household Living Standard Survey (VHLSS) to examine the factors that influence earnings in the BEZs and in the border provinces that host the BEZs and those where no BEZs are present, the research finds that the BEZs and cross-border integration increase the earnings of female labor. However, there seems to be a missing link between the establishment of the BEZs and cross-border integration and the improvement of female labor quality. Poor labor quality, and the predominance of the exploitative factors exaggerated by the unsustainable structure of the border-gate economy, are likely to make BEZs vulnerable areas of the GMS labor market where women’s rights are easily violated and female workers have little awareness and self-estimation of their working status.